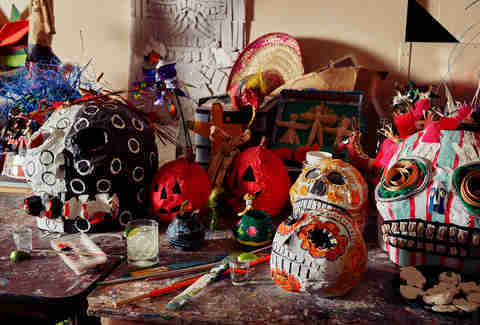 A multicolored, striped tablecloth is the canvas for painted sugar skulls and fiery red and yellow flowers in a vase. Tequila is the centerpiece, with an accompanying skeletal bride and groom duo. 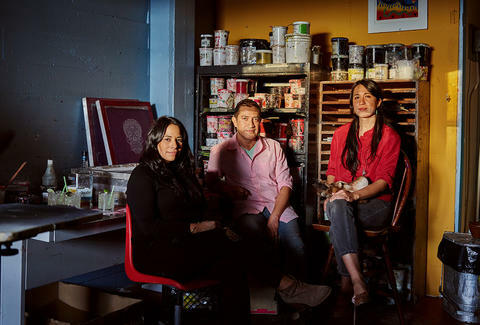 It’s stillness in anticipation of the first time that three local San Francisco artists will meet to celebrate El Día De Los Muertos – The Day of the Dead. Though centered around remembrance of those who passed on, this holiday encompasses community and a synchrony that each of these creators embodies in their work. Through visual elements, each artist captures a different layer of death and the intricacies around it. For papier-mâché artist Marco Nava, his skulls sculptures allude to symbolism between life and death on this day. For documentary photographer Nicole Franco, it’s in the way she captures little moments of humanity that deal with life’s daily struggles. For maskmaker Rachel Pozivenec, her work symbolizes an otherness and a correlation to death. The three have only heard about each other until now, but the anticipation to meet other artists builds they take their places at the waist-high table. They greet each other with warm smiles and discuss their work, their media, and their common connections to the Day of the Dead festivities. They toast “Salud” with shots of tequila and margaritas in short glasses, and each takes a turn sharing their favorite memory about Día de Los Muertos. Nava got into papier-mâché by accident. His first love was dance, and in order to keep his scholarship, he had to teach. He’d always struggled to find affordable, lightweight props that went well with his routines, until he thought of en grotto, a paste made of flour, water, and sugar used to make piñatas. "I remember being very young, approaching the market," he says. "You would smell all the flowers, the candles, the bread, the incense." But his most memorable Día de Los Muertos was two years ago. Davies Symphony Hall held an exhibition for Muertos sculpture, and Nava had to make a six-foot calaca (skeleton), using a technique called cartonería. Cartonería uses cardboard, because it’s inexpensive and fairly lightweight, painted with vibrant colors and intricate shapes. Cartonería is just one of the many techniques he uses. Holding up a black bowl with an orange lady slipper and other vibrant flowers, he says “This is one of my papier-mâché things.” He twirls it around for Franco and Pozivenec to see the lush green leaves painted on it, before setting on the table as another decoration. For Franco, this day is all about celebration. “It’s the colors, the flowers, the sunsets and illuminations from the candles,” she says. “This time of year is always dramatic for lighting, and you get these beautiful hues.” In Mexico, where she currently lives, it’s somber but -- perhaps paradoxically -- still joyful. Her most anticipated Día de Los Muertos moment is yet to come. She’s traveling to Oaxaca this year. The city is known for its rich traditions surrounding the holiday, and it’s one of the biggest celebrations in the world with thousands of altars, sugar skulls, pan de muerto, hot chocolate, and pan de yema that’s shaped like people for the holiday. Though having photographed Day of the Dead celebrations before, she cautions a first-time observer that "It's important to remember that although it's celebratory, people are there to remember and mourn. So to approach scenes with sensitivity and respect." Pozivenec's memories stem from seeing celebrations in San Francisco and Fairfax. As a first-generation American with Filipina and Slovakian heritage, she came to connect with the holiday after gaining an appreciation for the power of masks. The lights are dimmed in the windowless room, but there’s warmth from the smiles and the single pillar candle burning. It’s subdued and reverent, but filled with color. Between sips of margaritas, the artistic conversation turns to their work and collaborations. Right now, Nava has an exhibit that displays the altars of the holiday at the ​Mission Cultural Center for Latino Arts, all made out of papier-mâché. He shaped paper into chicken and grapes as ofrendas (offerings), a ritual that dates back to the Aztecs 3,000 years ago. It's a way of celebrating the celebration itself, and how the day binds people in conviviality. "We are laughing, we are eating, we are thinking, we are creating...it brings people together," he says. "Dia de Muertos is a holiday that is becoming more and more popular. I want to offer more color to this tradition, enjoying life now, and enjoy it also for those who are no longer with us." But where Nava sets a feast for the eyes, Franco finds that gearing down is her entry point to the community she seeks to illustrate. "The less equipment I have on me makes me more approachable, less invasive," she says, "because I do like to be close to my subjects, looking for those truly human moments that help define who we are and the times we live in." For her, the camera is not only a reason to travel, but a way of engaging with the community when she gets there. "It's exciting because I don't know where photography's going to take me next," she says. Plotting her Muertos adventure in Oaxaca, Franco plans to explore beyond the City Center. “To move beyond the commercial attractions,” she says. “Explore the ways in which the local outlying villages celebrate. Their cemeteries are wonderfully decorated and many of their personal altars are visible from just wandering through their communities.” Beyond that, her work is focusing on photographing the water scarcity and drought in South Africa and its relation to rhino extinction. Franco makes a similar observation, reflecting that she was "Inspired by their artistry and thoughtful production," adding, "I enjoyed learning about their creative process and what motivates them to express themselves." By the end of the night, the glasses are empty, but the conversation keeps stirring, from swapping ideas on different methods to enlightening each other on various media, the three walk away together learning that there’s never any limitation in expressing the intricacies of life and death. The dialogue will continue and manifest in creations yet to come. 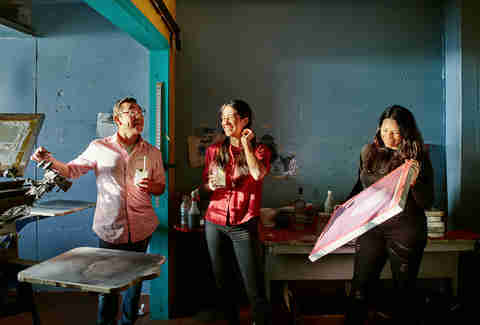 The photographer, the maskmaker, and the papier-mâché artist all exit together as a newly formed community brought together by their common love for creating art to celebrate Día de Los Muertos. Urmila Ramakrishnan is a freelance journalist currently based in San Francisco. Follow her novice photography on Instagram.